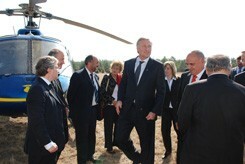 At the close of his two-day visit to France on 9 October 2007 which also led him to the Airbus Facility in Toulouse, the Czech Prime Minister Mirek Topolanek stopped over in Cadarache where he was introduced to the ITER project. Topolanek wants to increase the Czech Republic's share in both projects, government spokeswoman Jana Bartosava said. Two days before, Toshio Okazaki, President of the Japan Domestic Energy Agency, visited the ITER site in Cadarache. "Nuclear Fusion is one of the main research and development issues in JAEA and ITER is regarded as the core research facility within the Japanese fusion research", Okazaki said. M. Shingu Mimura, Governor of the Aomori Prefecture in Japan, visited the ITER site. As they are also constructing a large project, representatives of the Atacama Large Millimeter/Submillimeter Array (ALMA) and the Square Kilometre Array (SKA) came to discuss both the technical and managerial challenges of the projects with the ITER management. As the ITER projects develops, so does the interest of the media. Journalists from all over the world fly in to see how the biggest scientific project around is progressing.